I was delighted to see that my face is the face of the Battle of Bards 2016! My friend Vinny tagged me in a post on Facebook, and there I was! Hot dog! In NOW Toronto. That’s so cool!! 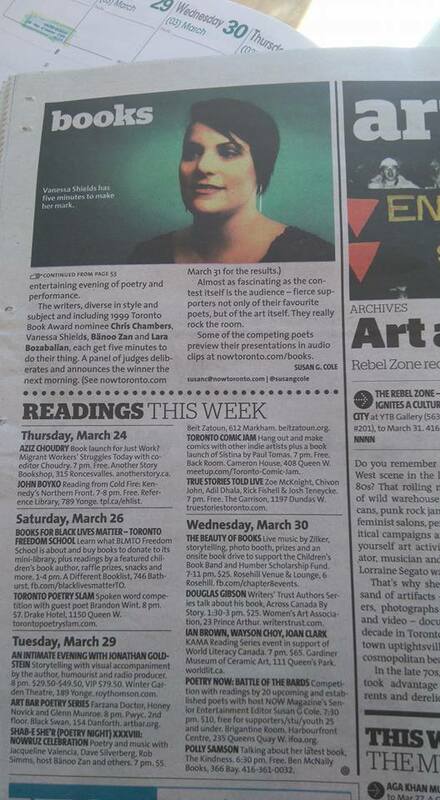 Thank you NOW Toronto for including my mug in your fine paper! Thank you Peter Freele for taking the photo. Boy, mama’s gonna have to put on make-up to look like the girl in the diva photo! Wait…that diva is me!! Thank you Poetry NOW and IFOA for keeping this battle alive. It’s going on 8 years! I always say the world needs more poetry. Well, we’re givin’ it, folks. And lookin’ damn fine while we are, right?! Next Post LOOK AT HER BOOK LAUNCH DATE ANNOUNCEMENT!